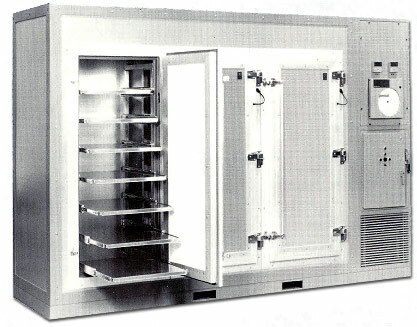 For Storage of Multilayer Bonding Sheets and Contact Film, Featuring a Fully Regenerative Non-Dusting Dehumidifier. Exterior: textured aluminum finish laminated to a 1/8” tempered substratum. Interior: white aluminum laminated to a 1/8” tempered substratum. Structural: ¼” aluminum angle top, bottom and corners, heliarc welded, ground smooth and painted, creating a structurally sound and easily transportable storage chamber. Jambs and doors are composed of a heavy duty anodized aluminum extrusion allowing for the accommodation of a self-regulating temperature controlled, anti-sweat heaters. Hardware; two latches top and bottom with bar release to prevent distortion and leakage at the door gasket. Gaskets; double extruded neoprene gaskets to insure the integrity of the temperature and humidity conditions. Door option; multi-light full vision windows. See price list. 7 each 20-3/4” x 30” deep stainless steel shelves behind each door. 24” extension ball bearing drawer slides with a push button lock in the out position for ease of loading and unloading. Recommended spacing 8” on center. See price list for additional shelves. Other sizes and capacity available on request. A fully regenerative, non-dusting desiccant dehumidifier. The refrigeration system can be water-cooled or air-cooled. No defrost cycle is required. The condensing unit operates continually, cooling the chamber temperature to a precise degree on a demand basis. Below 10º RH maintained throughout the dry bulb range. 304 stainless steel shelving used in all chambers. Two each, interchangeable temperature and humidity digital controllers. 2-pen temperature and humidity. 10” circular chart recording. These facilities are designed for the storage of prepreg sheets, rolls and contact film. Chambers are available in one, two and three door models.